how can i update my nokia c6 firmware from PR1.0 to PR1.1. I have updated my Ovi Store over 5 days ago, but I had no idea of what the update was for. It seems like Nokia is going in the right direction with their QT. I'm just waiting for Meego to come out and show us it's face. :). As per your post...it's supposed to have arabic...which is exactly what I'm looking for...could you suggest what should I do? N8 USER, 08 Feb 2011Everyday symbian^3 just keeps getting better, really like this. NOKIA your the best...but don't forget Symbian^1 user..
there are also qt apps for 3rd ed, though v3 is dead. Haha. Oh, I've just seen a review about the browser and the music player. How much does ANYBODY want to bet that the Android Fanboys will flood this thread like they do every Nokia Related thread? Mark, 08 Feb 2011Yes... Ovi is behind the Android market... except in terms of downloads where it isn't. As ... moreLast time I used the Ovi Store on my N86, it was absolutely awful compared to the App Store. Mostly ringtones and wallpapers. That was over a year ago. I've just had a look and there's much more to offer there, and also Apps like Whatsapp messenger and Ebuddy are available now. Nokia should have worked on maemo os a little bit longer to polish up the glitches and than stuff it with in the Nokia n8. I'm just sayin. Yes... Ovi is behind the Android market... except in terms of downloads where it isn't. As for 'a handful' I wouldn't call six million and a handful. Anonymous, 08 Feb 2011Symbian is a sinking ship, it just lost the no.1 position to android last year Q4, this year i... moreMaybe in your own virtual universe but this is real life and here, symbian remains a(if not the) major os in the mobile for years to come. Anonymous, 08 Feb 2011Symbian is a sinking ship, it just lost the no.1 position to android last year Q4, this year i... moreI don't know why you find joy in other's troubles. 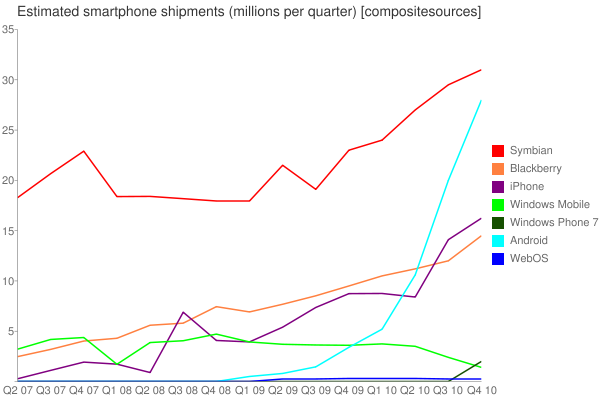 Nokia is still a good brand for plenty of people. Yes, they have been a little slow but they got a new CEO and things are likely to change. Anonymous, 08 Feb 2011 Is it just me or is something wrong with the tone of this article?Meaning?